Adagio’s Holiday Cheer Teas are now available for anyone looking to boost their Christmas spirit! For just £14 for 30 pyramid bags, there are 6 full leaf teas bound to give you that holiday cheer! I was kindly sent a box to try for myself and I wasn’t disappointed. Having tried several Adagio Teas, I’m always eager to try more. Another fantastic, gourmet collection of full-leaf teas from Adagio Teas full of holiday cheer. There are 5 individually packaged pyramid teabags of each flavour in this fabulously festive collection. I know so many Pumpkin Spice fans who would absolutely love this tea! A black tea infused with cinnamon, cloves and pumpkin to give a spicy, uplifting tea. This tea is reminiscent of the carnival favourite to enjoy all year round. With a rich caramel, apple & cinnamon flavour. A perfect cuppa for all gingerbread lovers! Infused with ginger, cinnamon and orange pieces this tea is perfect for all gingerbread men and women out there. A black tea infused with peppermint flavour and actual candy cane pieces! This is my favourite out of the collection, who doesn’t love a candy cane? Infused with sunflower seeds and chestnut flavour this is a warming cuppa, ideal for chestnut connoisseurs. This tea is bound to give you a comforting reminder ’tis the season to be jolly! Infused with cranberries and raspberry leaves, this festively fruity tea is a great compliment to your next festive feast. You are bound to feel the holiday cheer and warmth this season with this lovely collection of teas. 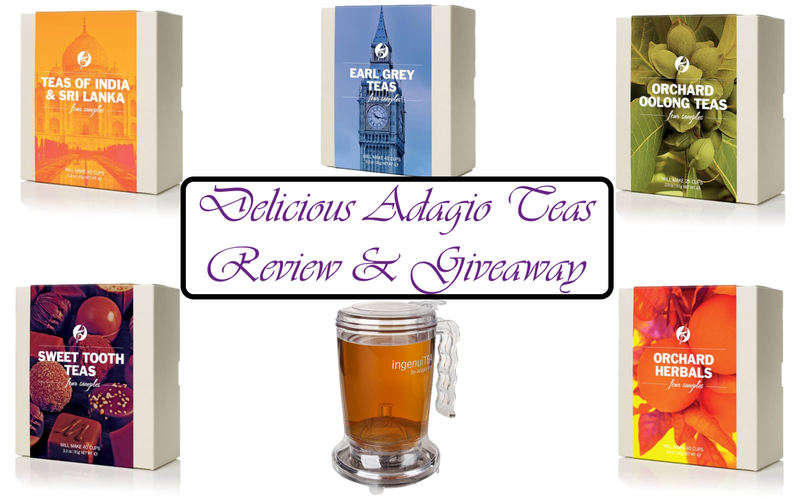 Adagio has a tea perfect for every occasion! Why not treat a loved one or yourself this Christmas? Which Holiday Cheer tea appeals to you the most? I received Adagio Teas Healthy Wellness Tea range last week. Just in time as I’m focusing more on mental and physical health & wellness on the blog for a few days. This week I’ve shared the mental health benefits of crafting and today I’m sharing some healthy wellness teas that will help your mind and body too. Adagio has kindly been sending me different ranges of tea to try out and share with you. I recently shared a large selection of Adagio Teas and their limited edition Wicked Teas, a Halloween special. Whilst reviewing Adagios different tea ranges I’ve become a big fan, each tea is a unique blend full of flavour. Enjoy a cup of tea blended to get you going in the morning, we all have days where we need a morning boost! An invigorating breakfast blend of toasted mate and black tea. Full of cinnamon and cocoa nibs, this warming tea will give you a kick of caffeine without the jitters! I love a morning cup of tea and Jump star has helped a lot this week. I’ve felt so ill I haven’t wanted to leave my bed but Jump start helps me feel a little more human! Sustain your afternoon with a cup of Daydream! Blended with soul-soothing herbs such as passionflower, lemon balm and lavender. The perfect cuppa for handling daily stress. Perfect for an afternoon or evening break from a busy day. Softly minty with a delicately floral bit of tanginess from hibiscus flowers. This calming blend is oasis in a teacup! The perfect cuppa to wind down with and promote healthy sleep, this bedtime tea will lull you into a deep sleep! A commonly used sleep aid, Valerian root is combined with soothing chamomile, spearmint and lavender. I’ve been drinking a cup before bed as my sleep has been awful lately and it does help me drift off much quicker! With winter approaching rapidly Adagio have the perfect trio of teas to ease the effects of winter sniffles and promote overall health and wellness. Tea and herbal blends offer care and kindness to your body and soul. Taking a moment to enjoy the comforting qualities is a great way to promote healthy wellness and take 5 minutes out. You can buy each tea individually or as part of the set for £20. Cleanse your body and lift your spirits with a minty fresh, spicy zest of detox Tea-Tox tea. Naturally caffeine-free with anti-inflammatory and antioxidant properties. This blend is specially formulated to aid in restoring your body to its natural state. I love this as a mid-morning tea. It really does leave you feeling perkier. A tea blend perfect for your sore throat. A warm and soothing cup of sweet liqorice, calming anise and fresh raspberry leaves. Add a bit of honey for an added coating effect and your sore throat will soon be feeling better! Yesterday I was worried my sore throat was turning into a chest infection so I tried Throat-Therapy and was pleasantly surprised how soothing it was. Hopefully, a few more cups of Throat-Therapy and my sore throat will disappear! Specifically blended with Pu Erh and ginger root to encourage stomach and digestive health. Happy Belly combines soothing Senna leaf and the natural sweetness of anise and liquorice. A cup of tea that will keep you tummy content. I’ll no doubt be drinking this tea fairly regularly, medication really affects my digestive system, as does stress. Happy Belly sounds like the perfect cup to calm that down! I’m sure you’ll agree these healthy wellness teas sound perfect, especially this time of year!